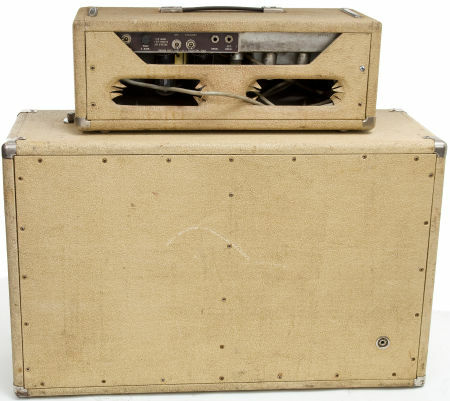 Just a quick point here for information sake as that the 6G6 and 6G6A Bassman also came with a single 12″ speaker cabinet in 1961 and early 1962 which should be listed as well. They also came in both tube and Solid State rectifier versions. I have 2 Blonde Bassman amps in the shop right now, so I just wanted to add some additional details on handles, logos and grill cloth for these 2 samples. 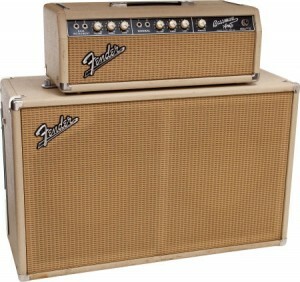 I have a ’64 smooth blonde tolex head and cab. Tube Chart Date NF (June 1964). Filter cap board stamped FA2064 (May ’64). Tube Chart on the 6G6-B label shows 6L6 power tubes, not 5881. Also the original cab contains a pair of Utah 12″ stamped 328614. OOOOOOPs.. speakers are stamped 328418.. bad typo, sorry! Привет! A stock 63 Bassman will have smooth blond tolex and a wheat grill, but don t get too hung up on the cosmetics. Over the past few decades, many of them have been retolexed or had different cloth installed. 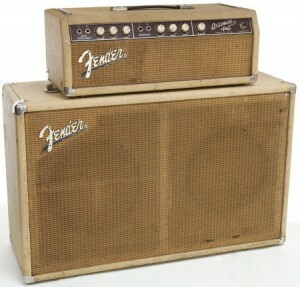 These are easy things to replace unless you absolutely need a completely original amp and cab. My ’63 ser# BP05546 came original with the lower B+ 125P19A PT. I understand a few twins were fitted with 7591’s used that PT. Anything is possible in Fenderland. I subbed a 125P7A clone while the original was rewound/reverse engineered but the sound was too clean & stiff for me. When the 125P19A came back so did the incredible tone/feel. IHOP a lower B+ with 120+ AC probably mimics the factory spec PT with early 60’s 110V. In reference to your comments about Fender 125P19A power transformer in your Bassman: was the performance you liked when using 6L6 power tubes? Edit to above: the rare twin referenced above used 7355 power tubes, not 7591’s. I guess when that twin didn’t work out the PT’s were put in some G6G-B’s. If your bassman has the factory spec PT try a variac at 110V……. Can you think of anybody that LOVES and can bring Bassman amps to Tone heaven? I have a 61 Bassman, that has some weird anomolies, and when i got it, it sounded terrible. After fixing it, my buddy left it with me, but it just doesn’t sound good. It’s spikey, and it sounds…not good. Can you think of anybody who can make it sound good. You want someone who can make it sound good? 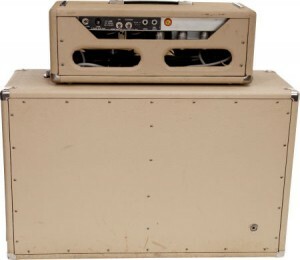 I took my Blond Bassman 6G6-B (Dec, 1963) to Giovanni Loria at Black Volt Amplification in Los Angeles. Stunned at how good it sounds now. Giovanni went through the amp doing what needed to be done. He said someone put in a solid state rectifier, but I told him to leave it in. After he recapped it, etc., he returned my vintage caps, but I’m not touching this thing, it’s perfect.